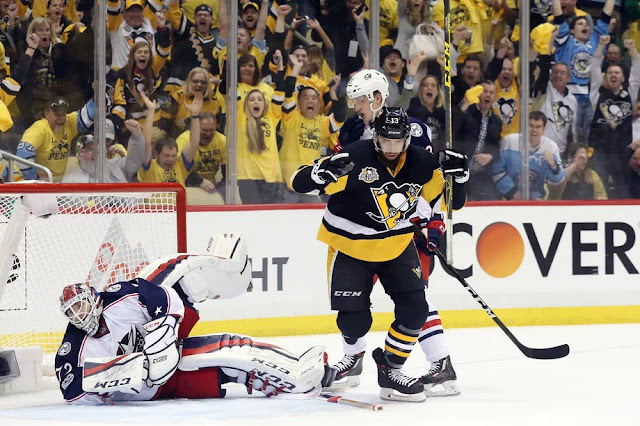 PITTSBURGH — The defending Stanley Cup champion Pittsburgh Penguins appreciate that their backup plan in goal is better than some teams’ best option. When Penguins’ starting goalie Matt Murray, a star in last June’s playoff run, was injured in the pregame warm-up Wednesday, their next man up was Marc-Andre Fleury, a veteran goalie with 98 NHL playoff starts. For a team looking to open the playoffs with a superhero performance in net, this was like switching from Iron Man to Spider-Man. Mask is different. Impact is the same. “(Fleury’s) a world-class goalie who’s been there, done that,” Penguins defenseman Trevor Daley said. “You couldn’t ask for a better guy in that situation. The reason why we call him ‘Dude’ is that he’s the coolest dude around." Fleury proved his value with a 31-save performance to lead the Penguins to a 3-1 win that gives them a 1-0 lead in the best-of-seven quarterfinals. His best moments came in the first period when the Blue Jackets outshot the Penguins 16-3 while threatening to take charge of the game. But Fleury gave his team a spark by stopping every shot he faced in those first 20 minutes. None of the Penguins had any concern about Fleury’s ability to handle the last-minute change of plans. He wasn't told he was going to start until after warm-ups. The Penguins have dealt with such a high number of injuries over the past two seasons that this situation didn’t seem abnormal. Fleury helped the Penguins win a Stanley Cup in 2009, and owns 54 career playoff wins. His experience undoubtedly helped him get through this situation. “We needed him because they controlled the game in the first period,” Penguins coach Mike Sullivan said. The veteran Penguins team did all they could to help him, blocking 22 shots. “I just tried to approach it as a regular game,” said Fleury who could remember only one other team in his pro career when he became a last-minute starter. This has been a difficult season for Fleury, 32, who had been Pittsburgh’s starting goalie from 2005-06 until last spring’s playoffs, when Murray became the goalie of today and tomorrow and Fleury transitioned into the goalie of yesterday. The Penguins expect to have more information about Murray’s playing status Thursday. Most teams would be devastated if their No. 1 goalie went down with an injury. But the Penguins will handle whatever happens. With the expansion draft coming this summer and teams only able to protect one goalie, it was clear that Fleury would be playing elsewhere in 2017-18. The Penguins considered trading Fleury before the deadline, but never completed a deal. Sometimes the best trades are those that aren't made. It would have helped the Penguins’ salary cap outlook if they could have moved Fleury’s $5.75 million salary. But they want to be the first NHL team to win back-to-back titles since 1998. They talked about how valuable Fleury would be if Murray was injured. As it turned out, Fleury is an expensive insurance policy that has already paid off. But the team didn't send down 3rd string Tristan Jarry and Murray didn't dress for the last 2 regular season games (though he did practice yesterday and start the warmup tonight). No concrete information now, probably not too much coming but buckle up. The NBC broadcast showed Murray during the warmups seeming to look uncomfortable while getting loose and extending his legs to make saves. He walked off gingerly. The rest of the lineup is as expected from practice yesterday, most notably Evgeni Malkin is back. Pretty even at first, Scott Wilson absorbs a big hit from Brandon Saad and briefly is pulled to the dressing room but returns. Columbus hitting everything in sight, the Penguins defense (namely Justin Schultz and Olli Maatta ) are jumping into the play very aggressively. Maatta makes a turnover in d-zone but Sidney Crosby is there with a nice defensive play around the net (made 2 in this period, actually). Evgeni Malkin stick-handles around the whole Blue Jackets team but the shot from Bryan Rust is broken up. With 7 minutes left NBC has shots 9-3 in favor of Columbus, but that's a bit misleading since scoring chances are just 3-2 (also for CBJ) at this point. Conor Sheary races on the backcheck to track his man and stop a pass, yep it's the playoffs alright. The shots continue to pile up. Maatta goes to the box when the NZ ref catches a hook (but he was cool with Crosby getting tripped earlier in the o-zone...) and CBJ gets their first PP. A bunch of shots but nothing really all that good. Shots end up a shocking 16-3. Not sure about scoring chances, but to this eye there weren't really many quality ones. But it's never good when that much rubber is being directed at the wrong net. The Pens come back stronger, Crosby line a decent first shift then a the Malkin line gets out there. Trevor Daley makes a nice, strong outlet pass up to the o-zone blue-line to Malkin, Geno passes over to Phil Kessel who deadens a puck with his skate over for Rust right in the middle of the ice. Rust makes no mistake, blasting a shot by Sergei Bobrovsky who hadn't seen a shot in over 16 minutes. Pittsburgh gets their first power play of the game, and the top unit strikes. Justin Schultz makes a hard pass down to Kessel, Phil hesitates, hesitates and from a stand-still rips a shot over the far shoulder of Bobrovsky. 2-0 just like that. Ironically the defenseman just standing there doing nothing is Scott Harrington, former Pens draft pick and a player involved in the trade to get Kessel. Life's funny like that sometimes. Next shift out, Kessel goal-hangs and gets a breakaway. Makes a nice shoulder fake to backhand move but Bobrovsky stays with him and makes a save on the backhand shot. Game remains 2-0 and my goodness that would have blown the roof off the place. Columbus takes a penalty than ogre Scott Hartnell tries to goon it up but no dice. The Pens get a power play and open up a shooting gallery, but don't score. Still pretty encouraging to see a lot of zone time, puck movement and chances tried. Game seems to settle down a bit, Pens just trying to keep it moving and get out of here. Fleury goes behind the net (and when has anything good happened from that) and the Pens can't get it out of the zone. Matt Calvert gets the puck soon after and spins, makes a nice shot over MAF's glove to get CBJ on the board. 3-1 with 7:19 left to go. And that about does it for the game, Columbus pulls Bob but the Pens don't score. Game ends 3-1. The refs made about 3 waiving off icing calls that made no sense in the 2nd. The first two hurt the Pens, but nothing much came of it. The third seemed to discombobulate the Jackets enough to give Patric Hornqvist and Bonino the space they needed to work magic and score. The NBC (OK technically USA channel ) feed showed what looked like a clear replay of Malkin allowing the whole puck to come back over the blue line when he was setting up to make his centering pass on the first goal. The Columbus coaches were studying their iPads or whatever, but they did not risk their timeout (and future challenge) on that play. Could have been a turning point as it looked like that one would have been called back. Slow pace of game with a ton of icings. 47 faceoffs in the first 40 minutes alone. Crosby led the Pens winning 11-of-14 through 2 periods, which along with a couple of good defensive plays, Sid had a great two-way night. So what's the bigger deal, the GOOD (whatever happened for adjustments/change in the 1st intermission and the response in the 2nd period) or the BAD (starting out flat, getting pinned in the d-zone a lot and giving up so many shots). Almost a Rorschach test for optimistic/pessimistic fan. Though I think most would agree that a fairly convincing and relatively easy playoff win is always a good night, those antsy moments in the 1st period not withstanding. Speaking of, Mike Sullivan told Pierre Mcguire during an in-game interview the Murray injury happened in pre-game warmup and they would have to evaluate him later. But a little convenient for them they didn't send Jarry to the minors, eh? Seems kind of obvious Murray's been dealing with something (maybe since the NJD save he looked a little gimpy after a Taylor Hall breakaway save) and just isn't right yet. Which, good thing the Pens didn't trade Fleury after all. I don't really think he had to make that many GREAT saves, but again winning any playoff game -- and stopping 16 shots in the 1st period to keep the game tied -- is no joke. Big time work and good for him, well-deserved after a roller coaster season. We may never find out, but one would have to think he sort of had an inkling that he might have been playing this game and it wasn't a complete shock to start this one. I don't know if you can flip a switch for playoffs or not, but tonight Kessel and Bonino were great again, just like many nights last post-season. The much maligned Maatta/Daley pair were on ice for 20 minutes (19:40 for Daley, 19:56 for Maatta), saw no goals against, helped on goals for and the Penguins won the game. Well whaddya know. Both were almost the highest Corsi pair for Pittsburgh on the night which is quite rich too considering all the hand-wringing about them around the twitter and the internets. In fact, if the Pens had a weak pair with performance, it was Dumoulin-Hainsey. Both struggled at times with the puck on their stick in the d-zone. That was eye test and Natural stat trick backed it up: Hainsey had just a 20.8% CF%, Dumo wasn't much better at 28.0%. Nice to see Sullivan putting Matt Cullen out as a LW two different times on 2 different lines in the dying minutes of the game, just in case they needed another center. The vet still adds a lot of value. The Blue Jackets power play is very dreadful (7 for last 73 after tonight). The Pittsburgh power play is very dangerous. This is a big difference of the two teams and the longer it continues to trend this way for the Pens winning the special teams battle (as they did tonight with a 2/2 PK and 1/3 PP vs. CBJ 2/3 PK and 0/2 PP) the more likely a series win becomes. Game 1 goes to Pittsburgh, a solid win after not having Murray available. Fleury was good early and then in the 2nd period Kessel showed out and it was all downhill from there. The Pens look to hold serve for home ice on Friday night for Game 2. As Marc-Andre Fleury stepped onto the ice at PPG Paints Arena for the Pens' pre-game warmup session, he was preparing to be the team's backup goaltender against the Columbus Blue Jackets in Game 1 of their First Round matchup. As he left the ice 15 minutes later, goaltending coach Mike Bales informed him that he would be the team's starter. "I just tried to approach it as a regular game and get ready for it," Fleury said. Fleury, the Pens' all-time winningest goalie in franchise history, made 31 saves in the emergency start as Pittsburgh defeated Columbus, 3-1, to take a 1-0 series lead. "It was fun," he said. "It's been a while. I was a little nervous in the beginning, maybe from not expecting it. … At the end it was a great feeling, a fun game to win." Fleury replaced scheduled starter Matt Murray, who suffered a lower-body injury during warmups. Fleury was challenged early as Pittsburgh was outshot dramatically in the opening period by a 16-3 count. "Every save is important and every play matters," Fleury said. "When you can keep the score 0-0, that's a good feeling. You gain a little confidence from it." But Fleury was zoned in from his first save 39 seconds into the game from Brandon Dubinsky to his final save on Scott Hartnell in the third period. And all along the way, with every glove save, the crowd responded with their boisterous "Fleury! Fleury! Fleury!" chants. "The guys did a great job in front of me all game long," he said. "They blocked shots and took rebounds away." That's typical Fleury. Deflecting the credit to his teammates. Never the braggart. And they do deserve some credit. After allowing 16 shots in that first period, Pittsburgh surrendered just 16 shots over the final two periods of the game. The Pens blocked 22 shots in the game, and the vast majority of Columbus' scoring chances were from the perimeter and low quality. "He's one of the most professional guys we know," center Nick Bonino said. "He didn't even blink. He went in there and made 31 saves for us. He was the first star of the game. He was awesome." It's been a trying calendar year for Fleury. After suffering a concussion late in the regular season, he was supplanted as the team's starting netminder during the club's 2016 Stanley Cup title run by Murray. Fleury endured trade rumors throughout the 2016-17 regular season, ultimately remaining with Pittsburgh. And Fleury, who has typically started in over 60 games a season, was relegated to just 38 games played this year. Despite the difficult circumstances, Fleury remained a consummate pro. He put team success ahead of his own desires, and acted as a mentor and friend to the 22-year-old Murray. "He's a great goaltender. He's a terrific kid," head coach Mike Sullivan said. "He's a great competitor. He's a good pro. And he's a great teammate. That speaks volumes of his character. It was a difficult year for him, no question, but he's such a good person and pro, he handled it as well as anyone." No one was happier to see Fleury have success than his teammates. "I couldn't be happier for a better guy," defenseman Trevor Daley said. "There's a reason you call him 'dude.' He's the coolest dude around. We're so happy that he got this opportunity and he ran with it." Because of his attitude during the year, the Pittsburgh chapter of the Professional Hockey Writers' Association named Fleury the team's Bill Masterton Memorial Trophy nominee, awarded to the NHL player who best exemplifies perseverance, sportsmanship and dedication to the game of hockey. "There were some stressful moments during the season," Fleury admitted. "Sometimes I had to find ways to stay sharp without playing. Toward the end I thought I was getting a little better. I'm just trying to build on that." Fleury owns the Pens' franchise records in wins (375), shutouts (44) and playoff shutouts (8). Tonight's contest was his 101st postseason appearance with the Pens, which ties Tom Barrasso for the most in club history. And he proved once again whey he has been the backbone of the franchise since being drafted first overall in 2003. "Fleury comes out of the bullpen and has a real good first period, made some timely saves," Sullivan said. "What can you say about his character and compete level? To step in and be as good as he was - he was key for us." 0 Response to "In surprise start, Marc-Andre Fleury comes up big for Penguins"